Welcome to Dark Area Lite. 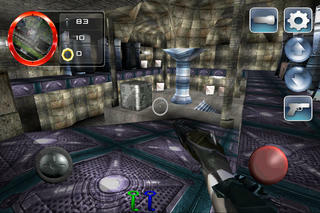 This is a lite version of a single player 3d first person shooter for IPhone and IPod touch. Your goal is to reconquest the EPS-71 planet. A fleet of aliens invaded all installations and they believe this planet is theirs. Exterminate the aliens and their leaders to clean the buildings. - Discover the first level of the game. - Collect keys to access different sectors. - Easy controls with auto lock weapon system. - Indoor and outdoor environments. - Different alien classes to fight. - Advanced graphics powered by Antiryad Gx 3D game engine. Required configuration: IPhone and IPod touch with iOS 3.2 (or higher). This game was developped by Arkham Development (http://www.arkham-devlopment.com/). You can also visit the official Dark Area web homepage and access forums.